If you’re a patient experiencing chronic pain in your heel, heel spurs could be the problem. This injury creates the development of a calcium deposit on the underside of your foot, between your heel bone and the arch of your foot. This calcium deposit forms itself into a bony-like growth, creating pain and other complications that need to be managed. Pain, swelling, or inflammation on your heel. Sharp or aching pain in the bottom of your foot while standing. The affected area is feeling warm to the touch. A small bone-like protrusion in the bottom of your foot. Heel spurs are caused by strains on muscles and ligaments in the foot. Over time, this stretches out the tissue in your heel and creates a calcium deposit that builds up. Heel spurs can be caused by repeated stress on the foot by walking or running on hard surfaces or even wearing shoes that lack appropriate support. Heel spurs cannot be diagnosed on your own since the symptoms need to be appropriately identified by a trained doctor. You will need to consult with a doctor if you suspect that you’ve developed this condition. Afterward, x-rays and other assessments can be conducted in order to diagnose the issue accurately. Treatments can include non-surgical options such as rest, stretching exercises and orthotics for arch support. In some cases, non-surgical treatment may not be enough to remedy the complication fully. Approximately ninety percent of patients report that nonsurgical treatment is useful in the treatment of heel spurs. Per a doctor’s analysis, they’ll be able to identify whether or not you need surgery. For these patients, surgical intervention can be conducted through techniques such as plantar fascia release or the removal of the spur. For some patients, they may be experiencing an uninhibited range of motion within the ankles. However, heel pain may still be a regular occurrence. Should you meet these criteria, your doctor may recommend undergoing a plantar fascia release. This procedure specializes in the relief of tension caused by the tissues within the foot. During the surgery, your doctor will make a partial cut to the plantar fascia ligament; releasing tension and removing any potential heel spurs that may be present. 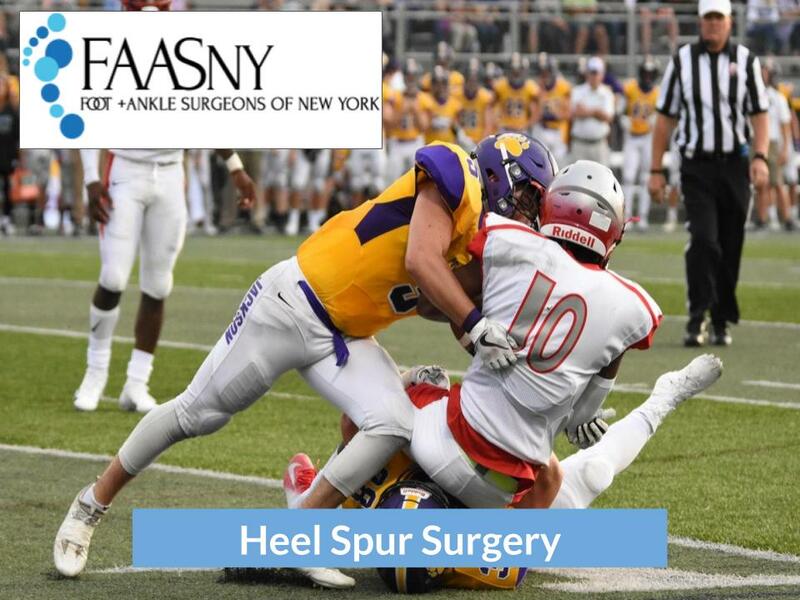 For questions regarding heel spurs and treatment options, contact Foot and Ankle Surgeons of New York for more information. Reconstructive Foot Surgery And Cosmetic Techniques In "Foot Care, Foot Surgery"